The most prevalent of these signs is the blue-hued Primus beer postings, which frequent the storefronts â€” usually tacked onto the side, next to the door. Their informal treatment makes their display feel compulsory â€” approximating how a NYC restaurant might treat a department of health certificate. In the western city, the arrangement of ads is much more carefulâ€¦and even hierarchical (it wouldnâ€™t be amiss to say that they are arranged by money more than they are arranged by people; i.e. the most visible positioning = the most expensive slot.) Â In this context, dispassion in arrangement is reserved for the strictly obligatory: the no smoking sign, the choking safety poster, the restroom sign. 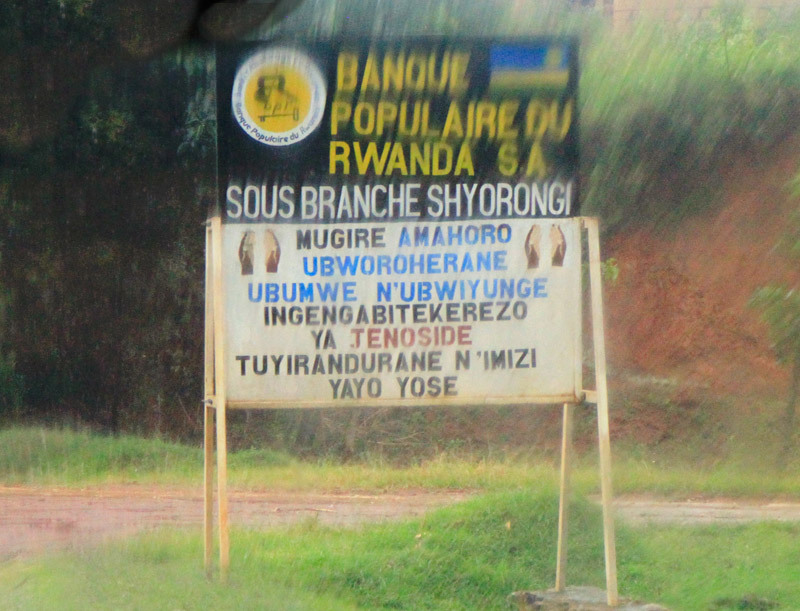 Refreshingly, all signs seem to get the same treatment in Rwanda. 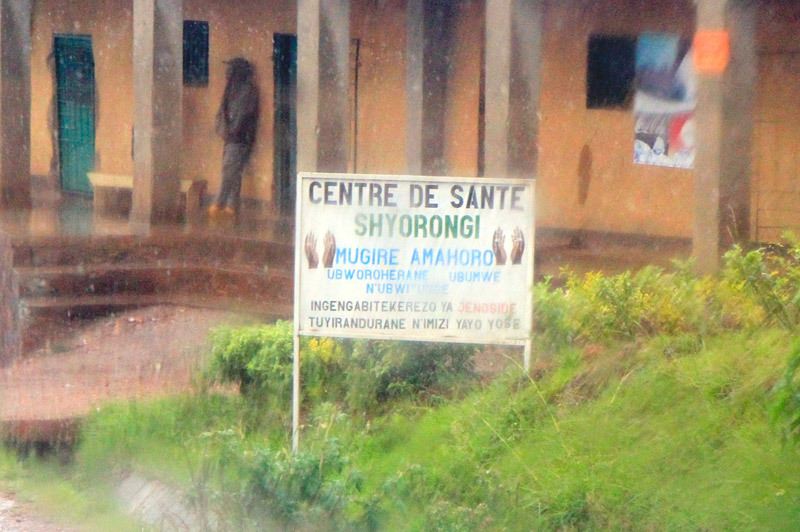 The Primus beer signs in Rwanda are a strange player here. The sole vestige of western ad aesthetics complete with logotype, spot colors, copyright notice (all alien in this agrarian culture) â€” they are also utilitarian objects, dutifully pointing to the beer. â€œThe beer is HERE!â€ This indexical function is immediately at odds with the western advertising’s tendency to disembody the brand from the object. Oftentimes, a NYC billboard will advertise a product that is practically unattainable in terms of the reasonable logistic measures. (Those showy 2003 Target billboards come to mind: the company consumed Times Square with ads before a store was open anywhere near Manhattanâ€¦much to popular annoyance.) The Primus ads sit [logically] at the nexus of consumer and beer, brand and product. How does such a practical arrangement of signage become the exception rather than the rule? Why do these beer signs seem so weird?? For a better answer than can be provided here, I recommend looking at Susan Sontagâ€™s essay, Posters: Advertisement, Art, Political Artifact, Commodity. In this 1970 essay, Sontag examines the assorted postings that cover the western city â€” distinguishing between the advertisement poster and the public notice. 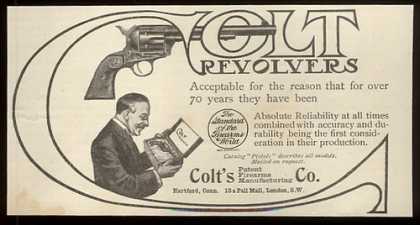 Â While â€œpostersâ€ historically arose out of the tradition of the public notice, she considers them notably distinct in “presupposing the modern concept of the public – in which members of society are defined as spectators or consumers.” Â Posters actively compete for the consumer: “the values of the poster are first those of ‘appeal’, and only second of information” while public notices “inform” – ostensibly conveying the straight facts on good authority. Â The beer posters share qualities of each communication method- straddling Sontagâ€™s definitions (in utilitarian defiance of western ad usage.) 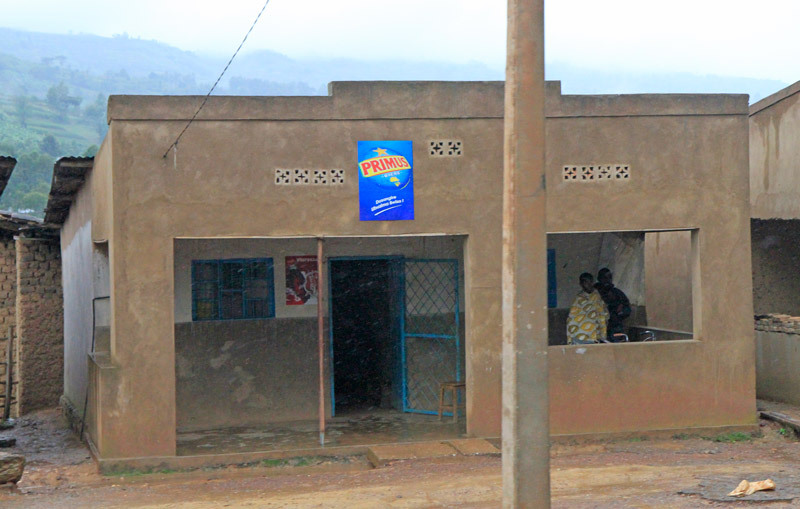 Although meant to stimulate commerce (or at least enable it) Rwandan shopkeeps’ deadpan use of the posters to point to the beer makes them function like an informative public notice â€” the tone of the communication is more akin to signage than appeal. The proximity of the notice to the goods bridges the brand to a physical product. It is a public noticeâ€¦ one that happens to lack the expected civic dimension and instead points to beer. We drive for miles through farm villages without any signage at all – not even beer posters. Â At set intervals, a different type of signage emerges as a repeating motif. 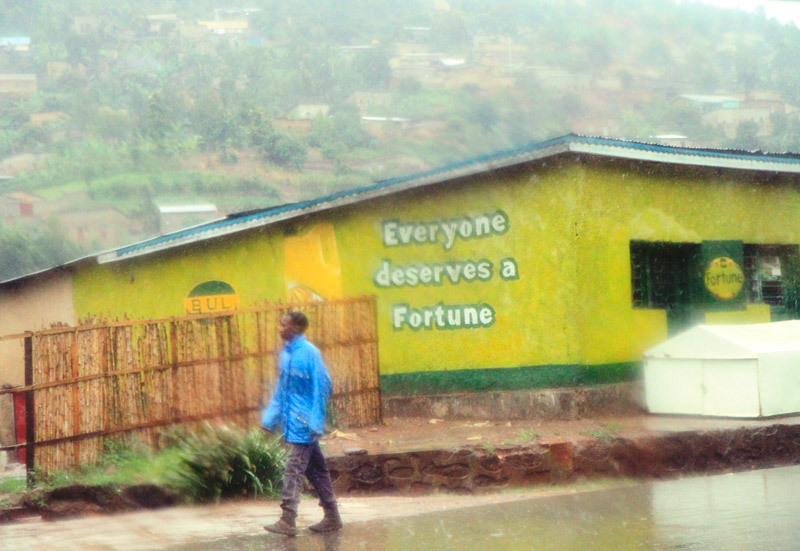 Sober reminders of the 1994 genocide appear on the side of the road – rendered in uniform block-lettered hand-painted type on standard white posts. Â Each sign shows a pair of hands in repose with text that bears the general message of “Genocide: Never let it happen againâ€ (as roughly translated by our driver.) Here is the proper, traditional public notice: the sign with a civic message to a country which has literally hit the reset button on what â€œcivicâ€ engagement means. To say that Rwandans had no other choice is an understatement â€” the countryâ€™s lone museum, the Genocide Museum, chronicles the ruin of a nation in horrifying detail. However, to say that theyâ€™ve had no choice also undermines the immense philosophical and political accomplishments of the people. It is impressive â€” even to the casual observer. One instantly picks up on a sense of â€œmass cooperationâ€: drivers yield to cars and pedestrians, strangers engage in polite conversation, Kigali residents excitedly discuss the cityâ€™s planned projects as if they were their own. Our driver enthusiastically chats with us about education reform, family planning initiatives, rural housing planning, urban street planning, and the political empowerment of women. There is virtually no crime to speak of. Everyone â€” right up to the nationâ€™s presidentâ€” is required to sweep their street once a month. They have more women in their Parliament than Sweden. Fifteen years after hitting â€œresetâ€, Rwanda is a nation of people wholly dedicated to civic enrichment â€” they are busy designing their future through policy. The genocide street signs stand as a reminder of this sentiment â€” the genocide was a beginning for unity, rather than an end. Rather than serving as an authoritative mandate from an aloof government, its interpretation emanates from the people. It is the peopleâ€™s sign, a symbol of unity. This is a public-notice-as-monument â€” reminding Rwandaâ€™s public of their accomplishments and setting the tone for the new generation. The signâ€™s deadpan format belies the over-arching convictions of a nation singularly fixated on the future. This is 16 minutes long animated film of logos and and advertising characters produced by a serious 3D house in France, and nominated for an Oscar, but yet in dire threat of lawsuits for use of corporate logos. At least this is according to the blogs, which, are… well… contradictory. But it is a hell of a great 13 minutes. Great villains, chase scenes, and a surreal vision of contemporary corporate life. It helps if you know Los Angeles. Great fun. Sad truths. Fantastical visions. I’m on an airplane to San Francisco as I write this, we are somewhere over southern Nevada. but I will post it when I land. I wait, despite the fact that everyone on this flight was given a trial voucher for an in-air wifi service that is partnering with the airline I am flying on. I took the card I was given, and listened to the instructions on how to activate service: it requires creating an account, signing up for the monthly service, though it was ambiguous whether you had to input a credit card. The salesman walked around to everyone in the waiting area and asked them if they had a “wireless enabled device” with them, and then offered them a card with a code on it. He was typical gregarious on-foot salesman, who approached people fiddling with their iPhones and asked them if they had a wireless device, and followed that with “oh, well, yes, you do have one!” as if he discovered that in the process of talking to them, and not specifically targeted them because they so obviously were twiddling with their iPhones. I knew almost immediately that I wouldn’t use the service; i felt like the corporate dealer was trying to make a user out of me, plus excessive registration processes repulse me, and even my junk email account is beginning to get overloaded. Also it was a 9AM flight, and I had only slept 5 hours. So I slept the first four hours, and woke up surrounded by people doing the same meaningless things that the internet is so useful for. I am pinned in by a guy in a speedy round of iPhone IM’ing that seems to never stop (his active arm needs room and he keeps elbowing me in the side), a guy who is playing WoW, and exhibiting all the signs of that form of addiction (though doesn’t he know that 5 hours is not long enough for a meaningful quest! ), and a guy who is intently looking at something, though I can’t tell what. How valuable is our public space to advertisers and marketers? An anonymous agent of the Anti-Advertising Agency made some calls. 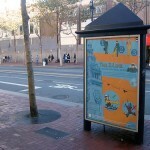 How much does it currently costs to have street level ads in a city like San Francisco? Here’s some examples. Background: Three sided containing four by six foot poster advertisements. Introduced to San Francisco on the condition that one of the three sides is used for art â€“ handled by the San Francisco Art Commission. Interestingly, advertisers are only interested in the 2 sides that face car traffic. Cost: between $1367 and $1473 per panel. But with a 16 panel minimum cost ranges from $21,866 to $23,562. This does not include production which could easily be thousands more. Cost: For a week of wildposting you can get 40-60 posters. Cost (including production) is about $4,250. Other Factors: Campaign design, testing, and evaluation costs not included. Advertising expenses are tax deductible. Our pals at San Francisco’s Billboard Liberation Front, feeling the heat after their recent ATT/NSA campaign, “decided to temporarily relocate to safehouses on the European continent.” While hiding out they spoke at The Game is Up! in Ghent Belgium and distributed one of their many valuable texts. 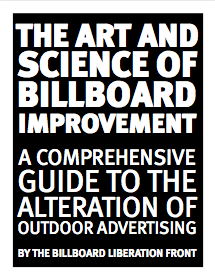 The new PDF of their The Art & Science of Billboard Improvement is free to download now. balmy night are all you really need. 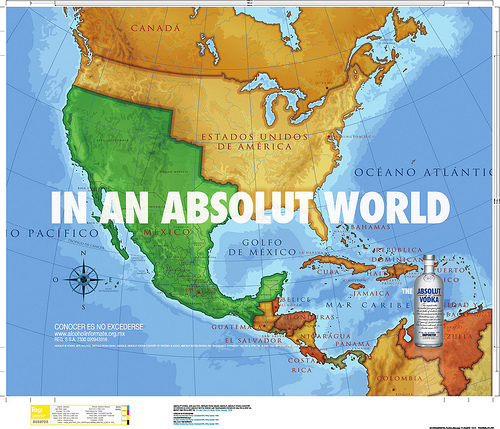 This map, used in a Mexican ad campaign, shows what the US-Mexican border would look like in an â€˜absolutâ€™ (i.e. perfect) world: a large part of the USâ€™s west is annexed to Mexico. Needless to say this map made its way to â€˜El Norteâ€™, annoying and upsetting many Americans â€“ even leading to calls for a boycott of the Swedish-made vodka. What must be particularly annoying is that this map has some basis in fact. Translation: The company advocates overturning borders that get in the way of imagining new maps of North America that help Mexico create a larger share of the continent. First: An ad agency with a pretentious mission statement full of doublespeak clichÃ©s about change and disruption? No way! Say it isn’t so! That’s never happened before! Second: Like every other agency, what these marketing pros “advocate” is getting paid by their clients. The way they get paid by their clients is to get their clients talked about and noticed. And that was Absolut-ly the goal here. Ad agencies don’t have a political motive. They have a profit motive. 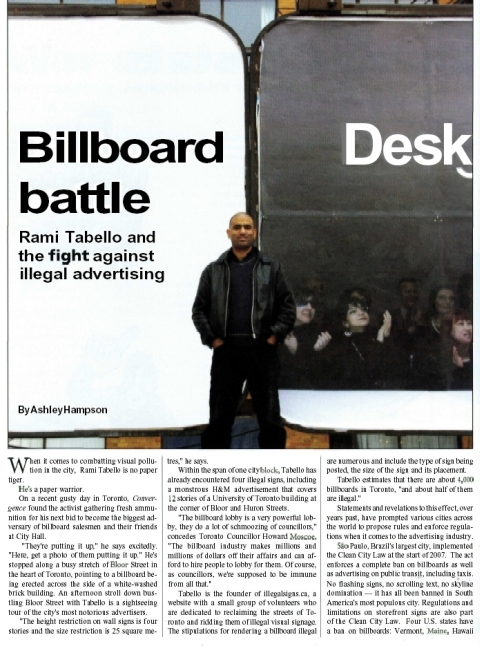 If you haven’t checked out IllegalSigns.CA yet, Rami Tabello is the man behind the removal of dozens of illegal billboards in Toronto. â€œItâ€™s turned the issue into a circus and has reduced the Toronto-East York community council into a council with a fetish about signs, rather than one dealing with development and other issues that are far more important than signs,â€ says Toronto City Councillor Kyle Rae. The takeover of public space for commercial promotion may be offensive, but it is usually legal. Occasionally, however, it is not. On Friday, March 14, it bordered on the criminal. That’s where I come in. I was the victim. 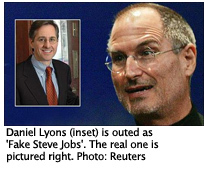 As a Times reporter, I tend to focus quickly on illegal marketing campaigns…. So I sensed a story on the evening of the 14th, when I came across two or three young men stapling posters for a new hip-hop album to lampposts, traffic signs and sidewalk scaffolding on Broadway, between 21st and 22nd Streets. It is unlawful, the city’s administrative code says, for anyone to “attach or affix by any means whatsoever any handbill, poster, notice, sign” on lampposts, traffic signs and sign poles or “other such item or structure in any street.” signsThe sign-hanging team would place stacks of posters in wastebaskets at the street corners, then draw from that supply to cover nearby street fixtures. I distinctly remember thinking, “No, I can’t.” Then, rather than antagonize him further, I started taking pictures of the poster-covered scaffold pipes across Broadway. The approach came so swiftly, I cannot even say whether it was from in front or behind. But I do remember a furious face inches away from mine as the man said he had warned me not to take any more pictures. The next few minutes are — as they say — a blur. I was suddenly on my back on the sidewalk, near the curb, trying to hold on to my camera and fend off my assailant, with my right leg pressed against his chest. Note: Not to discourage you from trying to stop illegal advertising as it happens. Remember, when you see illegal ads call 311, if you see it happening in progress, call 911. It might seem extreme, but the laws for graffiti are extreme. “Real beauty” from the makers of Axe? It’s been a while since we checked in on the Dove “Real Beauty” campaign, but I would feel remiss in not pointing out the new round of criticism its getting. In all my years of doing school workshops, I have never seen anything like the reaction of middle and high school kids. Almost ALL (no exaggeration) know the words to the Axe song, “Bom Chicka Wah Wah,” by heart and sing it immediately and enthusiastically with the video, and most of them have been to the Axe “spanking vixens” site. Now someone has re-edited Dove’s latest commercialâ€”replacing bikini bunnies from generic sources with those from Axe commercialsâ€”to call attention to Unilever’s hypocrisy. See A Message from Unilever. With luck, word will get around to all of those middle and high school teachers using the Dove spots as media literacy. The real lesson here is not that Dove supports “real beauty” but that corporations will say anythingâ€”even ostensibly critical thingsâ€”to sell their crap. Boston Boots Musicians for Marketing Messages? I love seeing amazing musicians performing in subways around the United States. When I worked in community radio, I even recruited some for on-air performances. I haven’t been to Boston in close to 10 years, but I remember the music I heard performed on the subways. Pyramid Radio created customized audio entertainment designed to entertain your customers and drive sales in your store. This give you, the retailer, the opportunity to influence customers inside your store, before they reach the cash register. As a Pyramid Partner you will receive powerful and targeted messaging and branding delivered by the nation’s top radio personalities and sent daily in the latest digital delivery. Music, commercials, and customized jingles are seamlessly integrated. Most importantly, as a Pyramid Partner you will share in the revenue generated by the advertisements which we sell. Some Boston transit riders are concerned – loosing a vibrant culture of street musicians so your subway experience turns into what it’s like waiting for a movie to begin in most theaters these days; inundated by non-threatening music combined with “seamlessly” integrated promotional messages. What kind of public transit are we headed towards where advertising is inescapable? The good news is it’s a pilot program and the MBTA is interested in public feedback, so let them know what you think – I did. There are already citizens responding, wanting to support musicians and get rid of T-Radio. T-Radio isn’t fully in place yet, so now is the time to speak up. 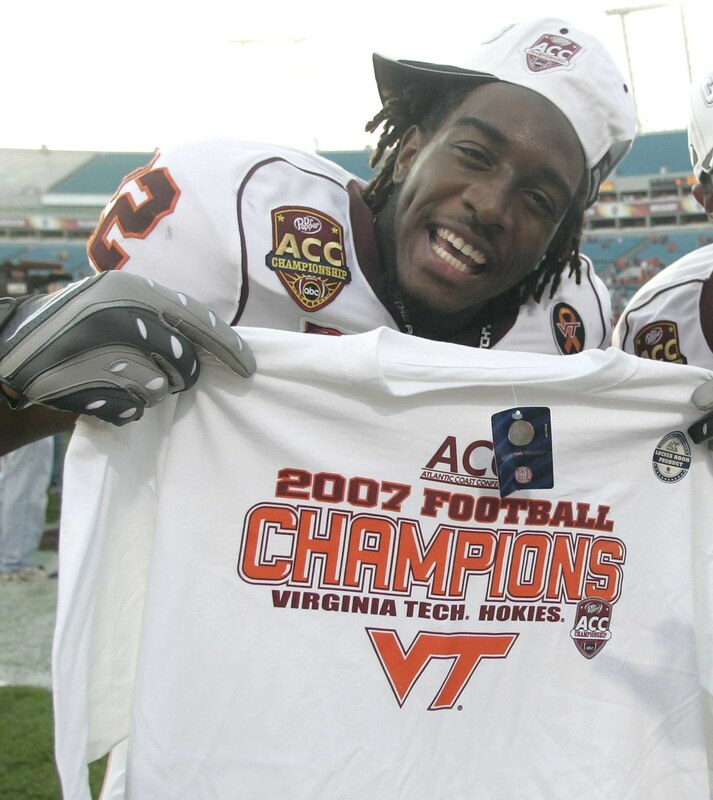 It’s been quiet here for a while. I’ve been busy these past few weeks on a side project for Conflux. 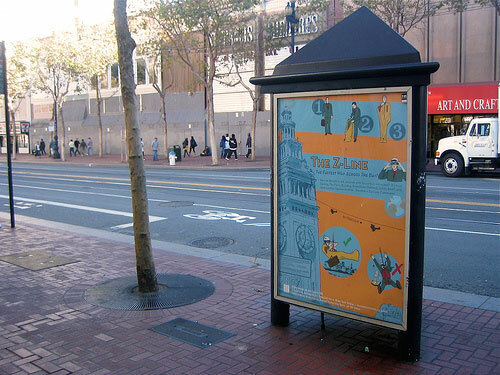 But more than that, a big new project with Packard Jennings (see Bus Stop Ad Project) has been taking up most of my time. It’s finally done and will be installed on Market Street in San Francisco in the beginning of November. A year ago the Municipal Art Society and other community groups began to pressure the New York Department of Buildings to enforce existing laws that ban advertising on scaffolding construction sheds and construction sites. After realizing the fine/profit ratio was out of proportion, the DoB physically removed much of the illegal advertising. An article in this weeks Village Voice explains that the DoB actually paid the advertisers to remove their own illegal ads. Also in the article: Outdoor Advertisers are heavily lobbying Melinda Katz, a Queens City Council member and candidate for City Comptroller, who has written legislation to make advertising on construction sheds legal. Worth reading. By the way, Queens is home to another corrupt politician, showboat legislator, Peter Vallone Jr., who angles for votes by vilifying graffiti and advocating for disproportionate fines and jail time for writers. Queens, where’s the justice? Mr. Achenbaum added, however, that he could not remove the billboards because he was ”bound to a long-term lease” with Sign In Properties, a signage company, for 20 years. Ms. Cohen added that if the hotel broke the lease, it would be contractually obligated to pay Sign In the projected lifetime revenue of the billboard, which she said would be a ”multimillion-dollar sum,” as well as the cost of the structure. In his statement, Mr. Achenbaum also said that to make amends, he had offered to let artists display their work on the back of the billboards in the future, and to give those artists $5,000 grants. The program has not begun yet, according to Ms. Cohen, because Mr. Achenbaum must first secure city permission to display the works. Ouch, that’s some lease. So the shortsighted landlord, thoughts clouded by greed, has had a change of heart. That’s nice. Sorta. Laws against billboards, how about wrap one? 3M, which remains the largest producer of the material, uses an adhesive similar to the one on its Post-it notes, enabling installers to place vinyl strips on a vehicle that do not stick until pressure is applied. The material is popular for wrapping racecars, helicopters, planes, boats and even buildings. Far from hurting the paint job, the wrap preserves it. The company either gives its brand ambassadors free cars or, more often, pays them as much as $800 a month. In the last seven years, FreeCar Media has hired about 7,000 motorists, who are instructed to park outside whenever possible, refrain from smoking, littering or swearing in their vehicle, and to attend a monthly influencer event where they hand out samples or coupons. They also have to send reports frequently with photographs to show where their cars have been. Of course, if you’re driving a mobile billboard, you are a de-facto ambassador of the company brand. So they also police their drivers behavior. People whose cars were wrapped with ads for two Coca-Cola products â€” Planet Java, a bottled coffee, and Vault, an energy drink â€” were cautioned against sipping Pepsi products behind the wheel. Nor could they park at restaurant chains like KFC or Pizza Hut that serve Pepsi exclusively, Mr. Livingston said. The whole thing raises all kinds of alarm bells. I suppose my biggest concern would be the evasion of regulation. The amount of billboards on the roadways is tightly regulated, and this seems like a way to get around that. This should be regulated from the outset as billboards are.